At Foss Leasing, we understand that fleet leasing management more than simply finding you a vehicle at the lowest price: it’s about choosing the best vehicle for the job, that meets your needs cost-effectively, and that provides the highest return. That’s why we are the Canadian leader in providing products and services that cover all aspects of running your fleet. The most “fit for purpose” solution is a combination of vehicle and services. To find the best vehicle, we begin by learning your business goals, your resources and your budget parameters. When we recommend a vehicle it may be a Ford 150 built for field service or a Tesla S70 for a Vice-President. We deal with them all. Then we interact with the manufacturer on factors like pricing, incentives, equipment, customization, painting or decals, and we make a comprehensive recommendation. We may recommend factory customization or a customizing shop, depending on the individual circumstances. Whatever the recommended solution, we will coordinate all aspects of the acquisition, customization and timing. We will also recommend a lease structure that best suits your requirements. It may—or may not—be the option with the lowest payments. It will be focused on the lifecycle cost to your business. We employ statistical modeling based on decades of used-vehicle values to come up with the most cost effective leasing structure for you. 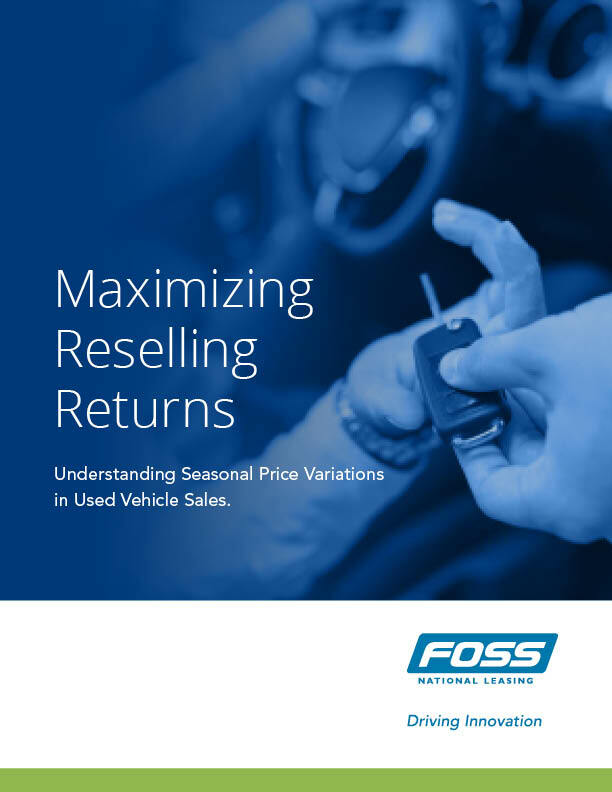 To minimize your lifecycle costs, it’s essential to resell your vehicles for the highest possible price. With our experience in market timing, and our multi-channel vehicle sales network, we can find the most effective sales strategy in the current market. To secure you the best prices, our remarketing experts constantly monitor the live and online auction markets and wholesale trends, as well as data from our own retail operations. Our One-Card solutions offer effective, easy-to use-technology that simplifies your bookkeeping and operations, while tracking and validating vehicle usage and repairs. The results: improved control over expenditures, reduced card misuse, less administration time. Our solutions are so effective that Foss National is Canada’s premier provider of fuel and maintenance card programs. Depending on how and where your vehicles are driven, it can be easy, or very challenging, to ensure that your drivers are kept on the road, with the best combination of price, efficiency and control. At Foss National, we offer One-Card fuel and maintenance options that provide ease of use and convenience, plus enhanced features for measurement, monitoring and control of expenses. We have industry-leading technology to prevent fraud or misuse, and powerful analytical tools to help you track and identify issues. Depending on your needs you can directly control the authorization of maintenance expenses, or you can let our Vehicle Maintenance Technicians represent you in negotiations with repair shops, within your preset spending parameters. Operating a vehicle fleet is time consuming, detail-intensive business, involving licensing and permits (perhaps across provincial and national borders) as well as driver training and safety, and management of accidents when they occur. We offer programs and services to handle every aspect of fleet and lease management—and we are ready to work with you on the specific combination of services that takes the administrative burden off your hands, while leaving you in complete control of your staff, budget and business.